LOS ANGELES (CN) – A dispute over dinosaur bones landed in federal court Thursday, with a California man saying he was ripped off by a small company claiming to have found a largely intact skeleton of a Tyrannosaurus rex. Robert “Butch” Vallee sued Terry Ciotka and Pangea Fossils in the Central District of California on Thursday, claiming breach of contract involving a $6.5 million transaction of a dinosaur skeleton found by a rancher in Montana. The discovery of the T. rex was touted by Pangea Fossils, a Canadian company that regularly deals in fossils from dinosaurs, mammoths and other extinct creatures, as the most complete T. rex specimen ever recovered. The T. rex was a bipedal carnivorous dinosaur that flourished on the western half of the North American continent, which was a continental island called Laramidia during the Cretaceous Period 66 to 68 million years ago. The first known T. rex fossil was found by Arthur Lakes outside of Golden, Colorado, in 1874. Lakes found a couple teeth. More than 100 years later in 1990, amateur paleontologist Sue Hendrickson found the most complete T. rex skeleton to date – 85 percent – in the Hell Creek Formation near Faith, South Dakota. 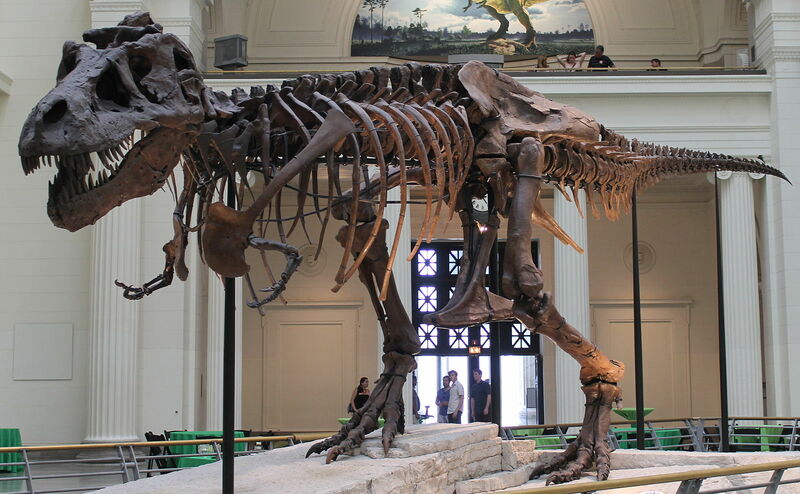 T. rex skeletons are often found in an incomplete state and are supplemented with cast bones taken from other excavation sites to lend the specimen a sense of completeness. In the present instance, Ciotka represented the skeleton as having approximately 220 bones, Vallee says in the complaint. Based on this information, Vallee agreed to pay a $200,000 deposit and pay anywhere from $6.5 to $6.7 million for the T. rex specimen once it had been fully excavated from the site in Montana. The contract was written and agreed upon by both parties in April 2012. Within six weeks, Vallee made another payment of $100,000 referred to as a “work in progress” payment. Despite Vallee’s payment of $300,000 Ciotka failed to provide drawings of the skull cast and later said the bone count may be significantly lower than originally advertised, closer to 150 than 220, according to the complaint. Then in November 2012, the two parties renegotiated the contract – lowering the purchase price to about $5.2 million largely because the skeleton was less intact than initially advertised, Vallee says. In the spring of 2013, Ciotka said the final bone count was 157 and the new contract was agreed upon. However, the contract required Vallee to make a $2.6 million payment in April 2013, an obligation he could not meet. Vallee requested his deposit back, which was refused and has yet to be returned. Vallee seeks a court order to return the deposit, as the contract stipulated a full refund should the deal fall through. Vallee seeks damages of $300,000 plus attorney fees. Pangea Fossils could not be reached for comment because the “Contact Us” section of its website repeatedly malfunctions. Vallee is represented by Randy Vogel of Laguna Hills, California.